A clean and well-designed layout can go a long way to helping with online traffic conversion. Directing traffic to your site is not always enough to convince potential customers to purchase your services or products. 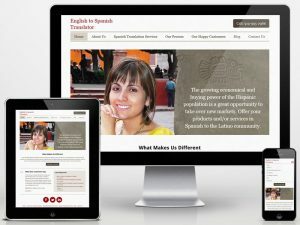 English to Spanish Raleigh understands the Hispanic community and it is our desire to help your business design websites that will not only serve your needs, but also open doors for your business to operate in new markets. Our Spanish Web Design team consists of native speaking Spanish translators that understand your target audience. It is our goal to provide you with a clear and understandable site translation that can increase your standing in the community and help increase traffic conversions. Creating a well-designed website can help your business perform better, and accurately represent your goals and services. Many business owners successfully view their website as a resume for their services. Maintaining a clean and well established website will help with your image and show prospects that your business is a leading figurehead in the industry. Throughout America, companies are adjusting and designing their websites to target the Hispanic population, which one of the strongest communities in our country. Our Spanish web design team are leaders in Raleigh that are experienced with creating websites that are quick to load, mobile friendly and in Spanish. Interested in Spanish Web Design? Are you ready to tailor your website, or design a new one to help your business branch into the Hispanic community? If so, please call 919-995-2986 or request a quote.